Situated across from the French Embassy in Prague, this colorful mess is a symbol of rebellion, freedom of speech and desire for peace. 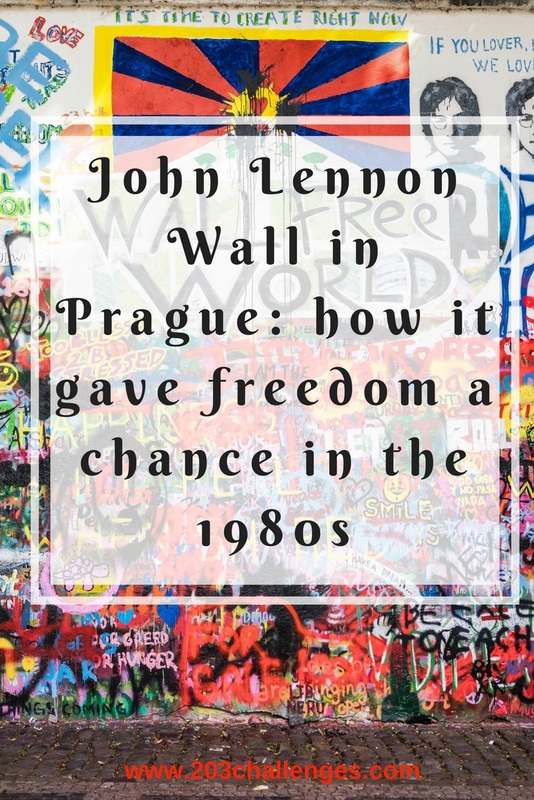 Though some may find the one-over-another graffiti unpleasant to look at, the John Lennon Wall is a monument to make you think, and one that tells the story of the power of dreamers. Monday, December 8, 1980. John Lennon – one of the greatest musicians and pacifists in the world – is shot dead in New York. The world is left shocked and in mourning. His legacy, however, lived on. He became a hero for the youth of Central and Eastern Europe, ruled at the time by totalitarian regimes that were the opposite in every way to Lennon’s philosophy of freedom. In fact, his music, as well as all other Western songs, was forbidden, and anyone who played such music or praised such art could have been sent to jail – a threat that didn’t stop them from doing so and from rebelling against the regimes. Neither did that threat stop the unnamed artist who drew the first image of John Lennon, along with some Beatles lyrics on the famous wall in Prague shortly after his death. That graffiti was a tribute to the legendary singer-songwriter, an act of protest against the communist regime of Gustáv Husák in Czechoslovakia and the beginning of the wall’s fame. 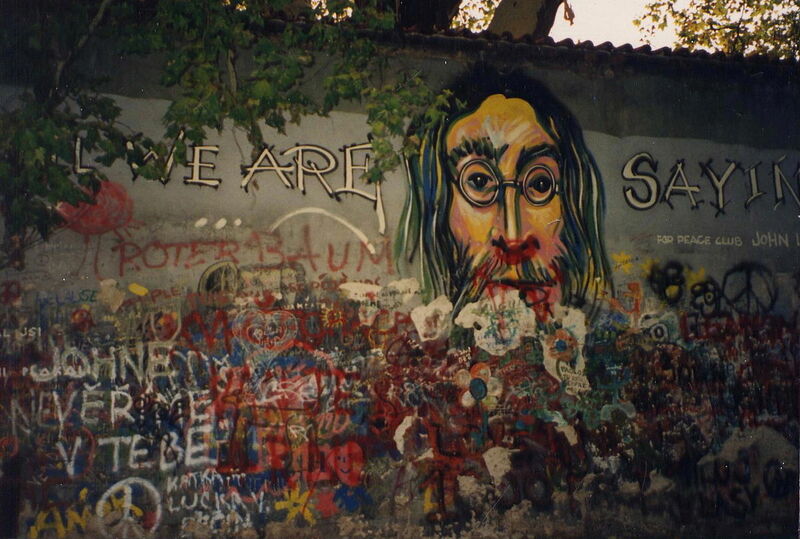 The wall became a place for the young to express their thoughts and to protest – with peace messages, lyrics and images of John Lennon, as well as anti-communist slogans. What followed was a repetition of the same events over and over again: the police would whitewash the wall and two days later the poems, the symbols and the portraits would appear there again. Neither the cameras nor the guards managed to stop the activists from sneaking in at night and putting their hero’s words on the wall again. All of that continued until 1989, when the Velvet Revolution – which is also believed to be partly inspired by the wall – put an end to communist rule in Czechoslovakia. The graffiti was now legal. It slowly turned to more universal ideals such as love and peace, rather than anti-communist protest, but still remained popular with local and foreign activists and artists. On the 25th anniversary of the Velvet Revolution, November 17, 2014, the people of Prague woke up to the news that “The wall is over” – in the night the whole wall had been painted in white with only those words left on it. The people who did this – students from the art collective Pražská služba (Prague’s service) – explained that they did not see it as an act of vandalism. They claimed that was actually a way to celebrate the anniversary of the “fall of one big totalitarian wall 25 years ago” and “it’s not an end, but a new beginning for the wall so it could have a new set of messages from the new generation”. Soon it began to fill with graffiti of the same free spirit again. Artists transformed the “wall is over ” text to the “war is over”, which can be seen today. 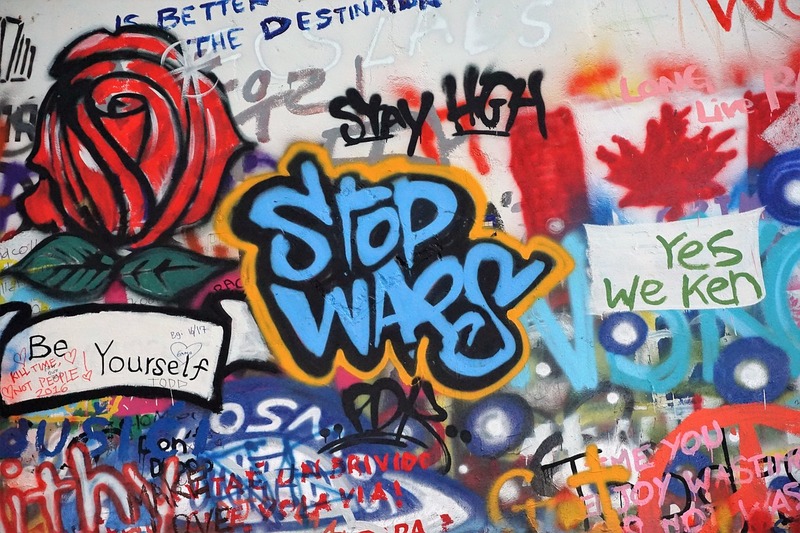 Although the original images and lyrics of John Lennon painted in the 1980s are covered now, the spirit of the wall lives on and attracts tourists, musicians, artists and pacifists, who use it to leave their messages to the world. The exact address of the wall is Velkopřevorské náměstí, Prague 1. The nearest tram station is Hellichova (trams 12,20,22, 57). Another way to get there is by metro line A – the station you need to get to is Malostranská. A 21-year-old student from Bulgaria with а special love for travel, books, craft beers, coffee and sucker for that perfect view. Shame on me, I’ve been to Prague several times when I still lived in Europe. It was even my first post-Communism destination in East Europe in 1990 (ridiculously cheap and totally different from today). However, I never made it to the John Lennon Wall. I really enjoyed reading your article and what happened to the wall over the years. Oh I honestly didn’t know about this. Thanks for sharing this great piece of information! I love finding wall art and this one is ever-changing but with a clear message of freedom, love and peace. I love the story of how it started with John Lennon and how it has evolved throughout time. And although the words that started it all are not there its message is still beautiful. Would love to go visit and see it for myself. Thanks for sharing the story with us! I’ve got to admit, I think it’s a bummer that the original images are covered now with a whole lot of not so great graffiti, but the spirit does indeed live on. Thanks for the post, it was an intriguing read!